Too many brands spend too much money cutting videos that don’t have a prayer of finding an audience. Now there’s a way to predict what topics will win before going to production. An 8-week research study that compares search demand to the patterns of what wins in video, revealing exactly which videos you should make. By categorizing all the searches and videos related to your topics and putting them in the Touchstorm taxonomy – a nested hierarchy similar to the animal kingdom classification system – you’ll learn that there’s more opportunity with canines than felines, and specifically, whether you’ll have more success with dogs, coyotes or wolves. We isolate your brand’s category as well as the lifestyle “conversations” where you have the right to play. We compare wolf searches to wolf videos to figure out if there’s more demand than supply or vice-versa. 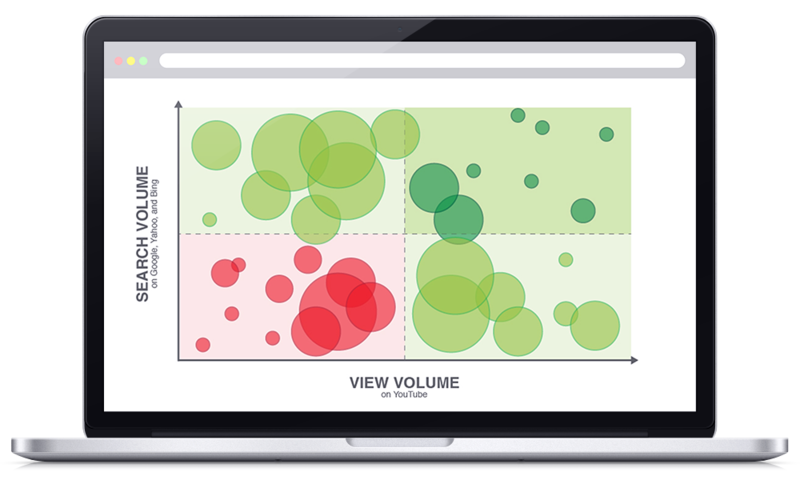 Touchstorm then plots all the potential topics on one bubble chart (see above) to reveal exactly where the opportunities are and how big each opportunity is. Finally, we then create production approaches that will work for your brand on each topic. Working together, you end up with a complete content strategy road map for your brand that can be applied to video, text, brand.com and social media. What’s Included in Topic Finder Research? A live presentation of the findings and recommendations with the Topic Finder strategist who worked on your study. An Executive Research Summary with a list of the highest-potential video topics for your brand, as well as other valuable insights. Complete Dossiers on the Search Volume and Video Popularity for the “Conversations” where your Brand plays. Conclusions of the videos you should make by title and prioritized according to your production budgets. Recommendations on talent and production styles that work for your particular topics and brand. A buying plan for your paid search that includes buying funnel priorities, share of search by category (current and target), budget needed to reach goals by funnel stage. Price is determined by the number of geographies, languages, and topics you request. Touchstorm conducts a limited number of studies each quarter, fill out the form below to discuss a study. out of my content strategy!